It has been determined that using a smartphone in certain ways can actually be dangerous while on the road. Fortunately, the Hyundai Elantra offers plenty of features that make smartphone use a lot safer. Therefore, you can use your smartphone in certain ways without having to worry about anything. 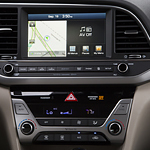 One of the best features about the Hyundai Elantra is that it puts the apps of your smartphone onto the interface once they are connected together. That coupled with the touchscreen makes it easier for you to access your apps without having to use your smartphone. It also has an app for smartwatches. With these features, the Hyundai shows a lot of thought goes toward all computer-related devices. If you want to be able to safely use your smartphone apps while on the road, we have vehicles like Hyundai Elantra at Hyundai of Kirkland. Check them out and test out some of the features.